The words that could best sum up the 2015 Spartan World Championship Beast held the weekend of Oct 3-4th are “spectacularly brutal”. 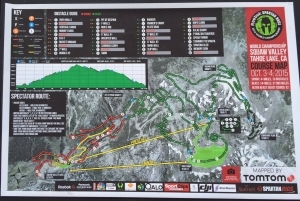 Spartan Race moved the venue for its World Championship race from Killington, Vermont to Squaw Valley near Lake Tahoe in California, the site of the 1960 Winter Olympics. 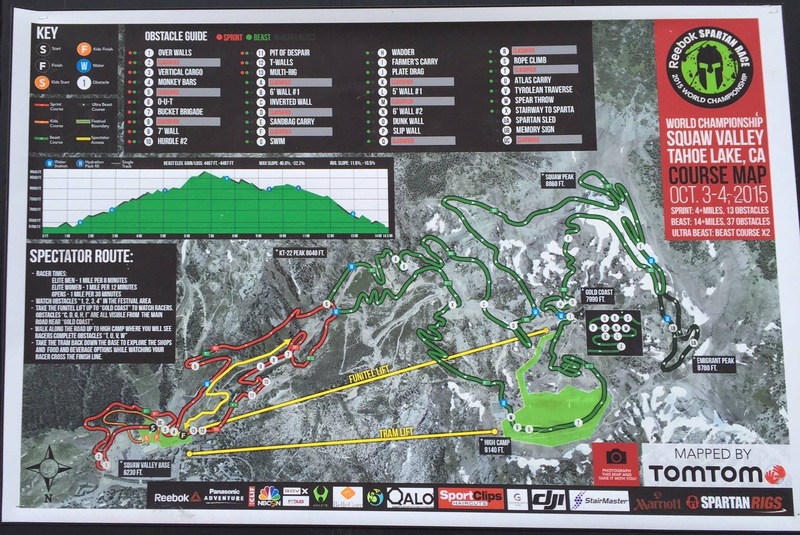 Squaw Valley was a nearly perfect venue – there was plenty of lodging on site and in nearby towns, lots of free parking, and the Olympic Village onsite had several restaurants and pubs to choose from after the event. My family and I arrived around 4 pm on Friday after a long drive, and entered the Spartan Race venue as the athletes were being briefed as to the rules and penalties for the race in the morning. The atmosphere was electric, and there was a strong international flair to the proceedings from Spartan’s choice of logo for the event (the Beast logo surrounded by flags) to multiple teams of international athletes that were present. For the first time, we also attended the pro-athletes conference where the top elite athletes were interviewed before the race by NBC and other members of the press, with questions about their thoughts on the sport in general, their training and preparation for the race, and so on. Apparently, this event was indeed a big deal. Race day dawned, crisp but sunny, and those of us running a little later in the morning had a chance to thaw out in the sunshine before we got started; a little longer than planned since NBC coverage of the elite racers pushed the start times back by about 1/2h. Soon enough we gave the customary “I am a Spartan! AROO! AROO! AROO!” and hit the course. The first mile or so was a quick loop over a couple of walls and through rolling mud, then up a relatively short climb onto single track trail that went through the woods and came back down to the staging area for vertical cargo net and uneven monkey bar obstacles (the latter of which lead to the first big burpee zone) before heading steadily back up the mountain. And up, and up. We passed a few more walls, the herc hoist, the inverted wall and a heavy log carry up and around a snowboard half-pipe before finally reaching the summit (8860’) at the seven-mile mark. 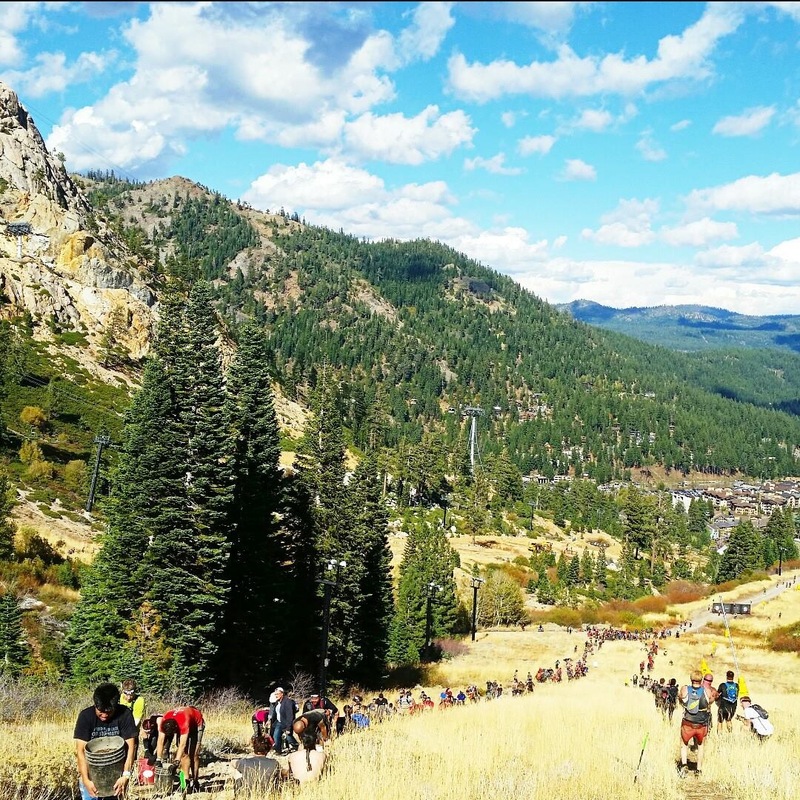 The views from the top, and indeed throughout the course, were breathtakingly beautiful; mountains all around, the festival far, far below, and glimpses of Lake Tahoe itself at intervals. The course then started winding back down the mountain, at mile 9 leading to the obstacle that would prove to be a game-changer and cause many to DNF the race. The swim – a simple looking, 75 meter swim around a buoy and out. The 54 degree water was enough to literally take your breath away if you weren’t careful, and many succumbed to hypothermia here or shortly afterwards. For the elite runners this was a mandatory obstacle; those in the open heats could skip it with a 60 burpee penalty, and many strategically chose this route. The volunteers on site encouraged those in the open heat to drop their hydration pack and supplies and pick them up afterwards. My wife and I quickly stripped down as much as feasible and legal, removing shirts, gloves and arm sleeves before putting on the PFD’s and getting in the water. As I swam on my back, I concentrated on breathing slowly and deeply, and this seemed to help. Once I had made my way to the ladder, I quickly put my dry clothes back on, and had some calories to help raise my core temperature. Unconfirmed reports had somewhere in excess of 700 people pulled from the race by the medics for hypothermia on Saturday alone. A short farmer’s carry and a climb back up a hill (I thought it was supposed to be all downhill from here?!) in a cold wind lead us to the next piece of diabolical Spartan ingenuity. A beautiful and awful gauntlet of obstacles that started with the plate drag, then had a very low barbed wire crawl to a wall climb to another barbed wire crawl. Turn around, barbed wire crawl, taller wall, barbed wire crawl, dunk wall, slippery wall, turn around again, barbed wire crawl, wall, barbed wire crawl. And then, to top it off, the rope climb (dry, over hay bales as they’ve done at the last few races). The dunk wall psychologically broke many around me in the open heat, and they opted for the 30 burpee penalty rather than go back in the water after that lake swim. Those of us who ventured the dunk wall found it not nearly as cold as the lake (and much much faster). A short running stretch brought us to the next few obstacles; the cargo net, Atlas carry, Tyrolean traverse, and the spear throw; set high on an exposed ledge, we threw directly into a fairly strong, gusting wind. 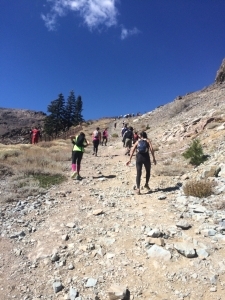 A long downhill segment with multiple switchbacks brought us to one of the other spirit-sapping obstacles; a very, very long uphill (and back down) bucket carry at mile 13. At this point in the race, it was a mental struggle and a huge physical grind. I have never been so happy to pour out a bucket of dirt in my life as when we finally reached the end of that one. More walls and a hurdle or two, and we finally made it back to the festival area, and the final obstacles – the traverse wall (no Z-wall this time), and a double-length multi-rig which for 90% of the athletes present should have simply been named “30 burpees”. A valiant effort got me nearly to the halfway point before my hand slipped and I went to the side to knock out my final 30 before the finish line. The medal and finisher shirts were both unique to this event and very cool in their own right, and everyone who pushed their way through cold, pain, cramps, and discomfort – whether it took them 2h, 25 min like Spartan World Champion Robert Killian, or 12h or more, definitely earned theirs. The next morning, before dawn on a colder, wetter, and sunless day, the would-be Ultra Beast finishers took to the course (along with the Spartan Charity Sprint and more runners taking on the Beast). 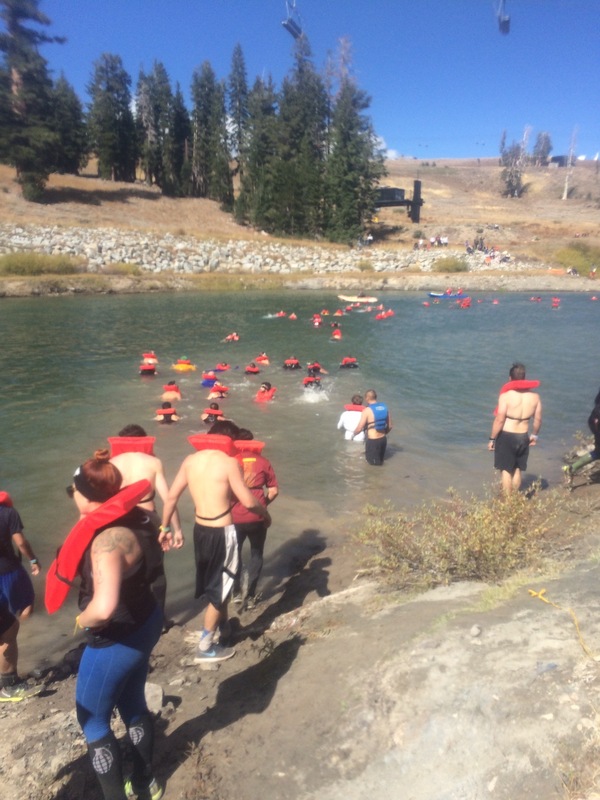 Conditions were harsher by far; apparently the water in the lake had dropped a full 10 degrees overnight, and the athletes who were able to grind their way through 2 full laps; over 30 miles and almost 70 obstacles have my complete respect. 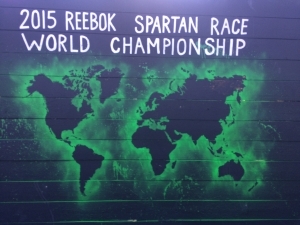 Although I’ve heard a few complaints about the course from athletes, I think Joe De Sena and the staff at Spartan Race struck a fantastic balance; a nearly 15 mile course with 4000+ feet of gain, several heavy carries and lifts, lots of single track running, and diabolical obstacle placement made this truly a World Championship course. My only real complaint would be that it was not spectator friendly; the spectator fee granted access to the festival area which had a scant 4 obstacles in view (vertical cargo, monkey bars, traverse wall, multi-rig). The vast majority of the race took place farther up the mountain. While there was a gondola running to take people up that was free to racers and volunteers, but cost spectators an additional ~$35 to ride. Hopefully, if Spartan Race returns to this venue (and I definitely think they should), they will negotiate to have gondola rides included in the spectator fee. The Gandala ride inclusion would have been great! Awesome review. 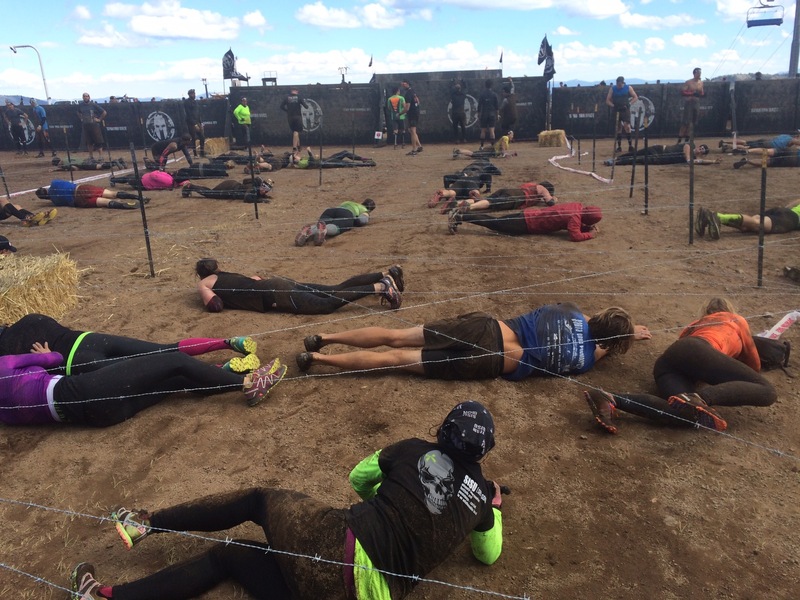 Congrats to everybody that endured that brutal course!